In the last month, Businesscardland has become well known across the world. It was brought to our attention that you could not use many of the special accented characters used to type many European and Latin languages. We are happy to announce that we have re-tooled the Free Business Card Maker to support French, Spanish, Dutch, German, Norweigan, Swedish, and Portuguese characters. If you are using one of these languages and still having trouble, please email us so we can investigate... we only speak English and French, so if you can make your request in one of those languages, it would be best. We are going to launch international business card sizing and A4 paper support this month, so bookmark our site and check back soon. 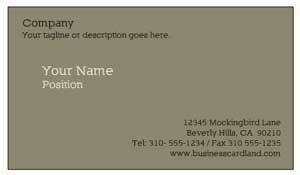 Business Card Maker Creates PDFs! 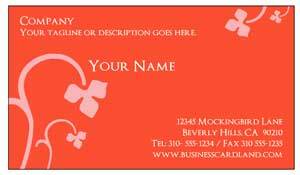 We are very happy to announce that the free Business Card Maker now creates PDF files of your business cards! This will allow you to save your files, print them at a copy shop, the office, etc. You also now have the option to save single cards which can be used to submit to offset printers. We create our PDF files using CMYK color, and allow you to choose a full-bleed design which will give you wonderful, professional, full-color cards. Just in time for the holidays we've added a Gift Tag maker. You can print ten tags per page, customize your colors and info, and print on plain paper or with standard 10 per page business card paper. Click on the Gift Tag Styles menu on the left to pick your style and start tagging. Just added a new style, "Simple Serif", which is a straightforward card with a serif font with just a touch more personality than times. Enjoy! Added a pretty swell looking style, "Floral One", which looks great with a plain white background (low on ink usage) or in colors.